While other well-tenured membership plugins slip further behind their newer, more innovative counterparts; Paid Memberships Pro has experienced a resurgence over the past year or so, bringing unique and exciting functionality to the table that makes it a top contender despite some of its flaws. 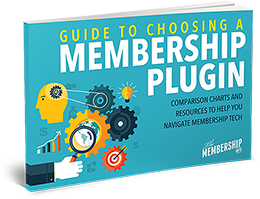 You’ll be hard-pressed to find another membership plugin with as much to offer. 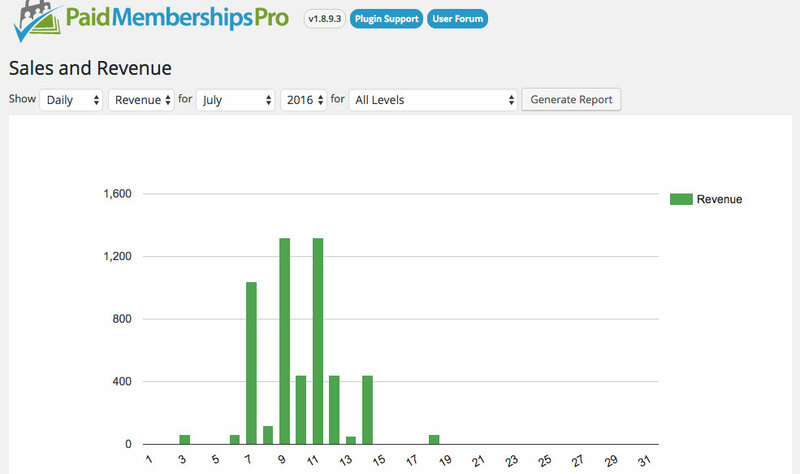 Paid Memberships Pro has gone through something of a revival recently. That’s not to say it ever went stale or dropped off the scene; however for a time it did seem to be lagging behind alongside some of the other well-tenured membership plugins on the market, while new kids on the block such as MemberPress and Member Mouse started nudging ahead with cool innovations and fancy features. However husband and wife team Jason and Kim Coleman have stayed true to course, steadily working to transform PMPro from an already solid membership solution to one that packs a serious punch with some impressive and unique bells and whistles. In terms of features, Paid Memberships Pro is a study in contrast. On the one hand, its strength lies in its ‘Add On’ system, which allows you to optionally install and activate a wide selection of features and functionality – some of which you simply won’t find in any other membership solution on the market today. The ability to create member directories, have unique member homepages, offer gift memberships or enable members to sign up with their social media profiles – to name but a few of the types of add-ons available – gives you a wealth of flexibility in tailoring the plugin to best suit your needs. However PMPro is let down somewhat by shortcomings in what many have come to see as the bare basic requirements for a membership plugin – such as the ability for members to have more than one active membership level, or even the ability to offer multiple payment options to users rather than being limited to a single processor. In fairness to the guys at PMPro, they seem to be using their Add-ons system to provide workarounds to some of these issues – for example you can get an addon which enables you to sell access to a specific page on the site, which addresses one of the main reasons people may want multiple membership levels as a means of offering upsells. There are some add-ons, however, that feel like they should be part of the core system. It’s arguable whether the ability to drip-feed content should be built into the core plugin or not; but when it comes to something as fundamental as collecting your members full name during checkout you really shouldn’t be made to install something extra! One of my major gripes with this plugin is the way in which you protect content. This is done either by using post categories, or by designating required membership levels on a per-page or per-post basis. While this will satisfy the most basic of needs, it becomes a bit of a nightmare if you’re dealing with large amounts of content that use WordPress ‘Pages’ instead of ‘Posts’ (i.e. if you create your content before installing your plugin, and you’re using pages you will need to go through one by one and set membership levels) – or, even worse, if you’re using custom post types. Custom post types are becoming increasingly popular as a way of having a more diverse mix of content in WordPress. Some themes or solutions such LMS plugins use custom post types; however PMPro does not protect those ‘out of the box’ and while you can get a basic add-on to add support for custom post types the way in which protection is handled for them is largely inadequate. The lack of an ‘All Posts’, ‘All Pages’ option that can be extended to custom post types when it comes to setting up protection does make life difficult for all but the most basic of membership site needs; and while it would be too much to expect a Memberpress-esque “Rules” option (which itself is not perfect, but certainly more serviceable than PMPro’s approach) we can only hope that this is an area that the team plan to strengthen in the future. This is what makes PMPro such a tricky plugin to review, because in describing the add-ons above we’re only just scratching the surface of some of the cool stuff you can do with this system; but all of the bells and whistles in the world don’t matter if the fundamental features are lacking. What is without question is that the team at PMPro are clearly putting a lot of work into continuously improving this system; so we have our fingers crossed that some of the areas that frustrate us with the plugin will be addressed in due course. Also worth mentioning is the fact that Paid Memberships Pro is, possibly, the only top tier membership plugin that also has its own WordPress theme too. While not exclusively limited to PMPro, their ‘Memberlite’ theme is designed with their own plugin in mind and as such includes styles for pricing tables, account pages and other features. While we won’t linger too much on the theme since the focus of this review is the membership plugin, it’s definitely a feather in the cap of PMPro that, once again, helps them stand out from other solutions. By focusing on the essential functionality and saving all of the ‘fancy stuff’ (technical term) for add-ons, Paid Memberships Pro becomes relatively simple to set up. You’re prompted by on-screen messages that take you through the required settings, and those messages will hang around until you’ve done the bare minimum needed to make the plugin functional, ensuring you won’t miss anything. Membership levels are fairly easy to set up, yet despite their simplicity you also can do a lot of cool stuff with them such as charge a higher initial fee, limit the billing cycle and set a trial period; some of which is not always possible with many membership plugins. 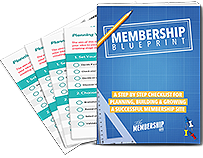 The fact that you can simply duplicate your membership levels is a handy time-saver too. 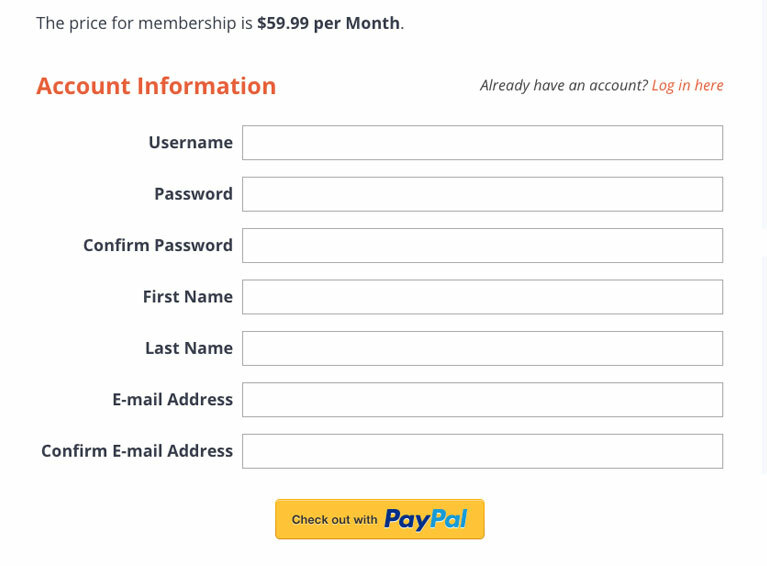 As already mentioned, the manner in which these levels are then used to protect content is disappointingly limited; and the lack of an easy means of simply copying a direct link to the checkout page for a given membership level seems like an oversight – particularly since most membership owners will want to create their own sales pages rather than use PMPro’s “pricing tables” shortcode, and therefore will have need of a simple URL that they can link their call to action buttons to. You can figure it out yourself, but you shouldn’t have to. The plugin enables one-click setup of the account pages they provide for users, which is useful, or you can set these up yourself using the variety of shortcodes available within their extensive documentation on the PMPro website. By focusing on essential functionality and saving the ‘fancy stuff’ for add-ons, Paid Memberships Pro becomes relatively simple to set up. While we’ve sung the praises of the add-on system so far, it’s not all perfect. The mixing of plugins that are part of the free plugin in with ones which require you have a paid-for license is – without doubt – going to trip some people up; and perhaps that’s by design. There are also inconsistencies in where these various plugins take residence within your WordPress installation. Some add settings to specific pages in the PMPro menu; some add new items to that menu; some add options into the theme customizer, some to the standard WordPress ‘Settings’ menu. Some don’t add any settings or options at all. Coupled with a lack of post-installation guidance and some of the links to plugin documentation being broken or outdated it can lead to a frustrating 30 seconds of clicking around with each add-on you install. There is similar inconsistency with the ease of use of the various add-ons. While some seem to be well-thought out enhancements and additions with extensive options and so on, others are clearly quick fixes and stop-gaps. This isn’t enough of an issue to undermine how great the add-on system is, but it can cause a little bit of a love-hate relationship with the plugin as a whole during initial set up. Paid Memberships Pro gets even more powerful when you implement the various shortcode options they have available, and for developers or anyone comfortable with code they provide a treasure trove of custom scripts on their official blog. Some of those code snippets have become add-ons in their own right, and perhaps more should; but it’s all let down somewhat by inconsistent documentation and a lack of any real structure to how it’s all organised. One of the main uses of the add-on system is to enable integrations with a variety of different services; and the decision not to include any email marketing platform support into the core plugin package is an unusual but, in my opinion, smart one since it keeps things simple from the off. 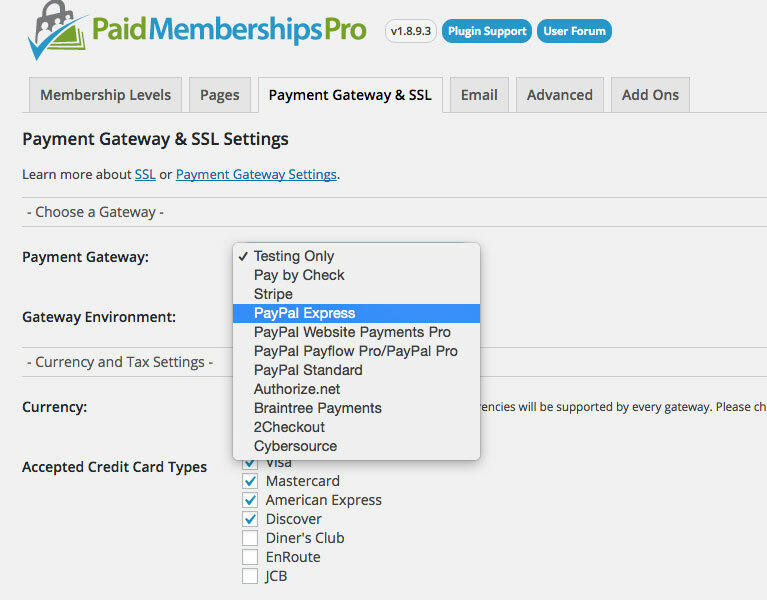 In terms of payment processors, Paid Memberships Pro has built-in support for the usual suspects (and a few unusual ones) – with extensions to add Paypal Express as an secondary checkout option (frustrating that they don’t enable this as a standalone option like many other plugins do) and support for check payments and Payflow. Interestingly there’s also an add-on to use PMPro alongside Woocommerce, which is definitely intriguing and means that if your payment processor of choice isn’t supported by PMPRo but is supported by Woocommerce then this could be a workaround. It’s not just payments and email platforms that PMPro integrates with; amongst the add-ons you’ll find options supporting affiliate systems, the aforementioned social login and Woocommerce support, as well as an integration for Slack, which is gaining ground as a system used by many new memberships. The core Paid Memberships Pro plugin is available free, which provides access to the basic plugin and a selection of free add-ons that include support for Aweber, Mailchimp, bbPress, Infusionsoft and more. While the free option does not include support from the developers, you can buy their core option which includes this for $97 (for the first year, $47 for each year after that) for a single site license. And if you want to get your hands on everything – the full range of free and premium add-ons, the Memberlite theme, developer support etc then this costs $197 (for the first year, $147 recurring yearly after that) for a license which covers unlimited sites. It’s clear that the Paid Memberships Pro team have put a lot of thought into user experience. Registration and checkout are slick, and at the end of the process members are provided with detailed information about their transaction with the option to print off an invoice. The fact that you can customise all pages in this process is a definite plus, meaning you can add tailored welcome messages as well as select custom page templates for the checkout process. Paid Memberships Pro offers a good deal of member self-service; from the ability to retrieve invoices and view billing history, to being able to switch yourself to a different level or even cancel your account. It’s a shame, however, that some of those great options don’t come with any degree of admin control which would enable you to – for example – allow self upgrading but disable cancellations. You can technically do this by removing pages but you will likely have to do some hacking with CSS to hide certain links or mentions of features you may want to remove. It’s a relatively minor bugbear, admittedly, but with so much control available thanks to the add-on system it almost makes minor things like this more frustrating as you become a little too accustomed to doing things your way. Given how few membership plugins out there actually offer any form of reporting, it’s surprising that the PMPro team don’t make a bigger deal out of the fact that not only do they have reports built-in (by default, not as an add-on) but that they’re also rather good. As well as providing stats for signups and cancellations, the PMPro reporting suite includes reports on member activity (visits, logins etc) and sales and revenue too; with some handy charts available that compare key performance indicators against each other. 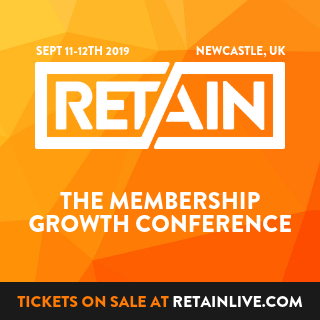 The addition of key membership metrics such as churn rate and customer lifetime value would really take this feature to another level. 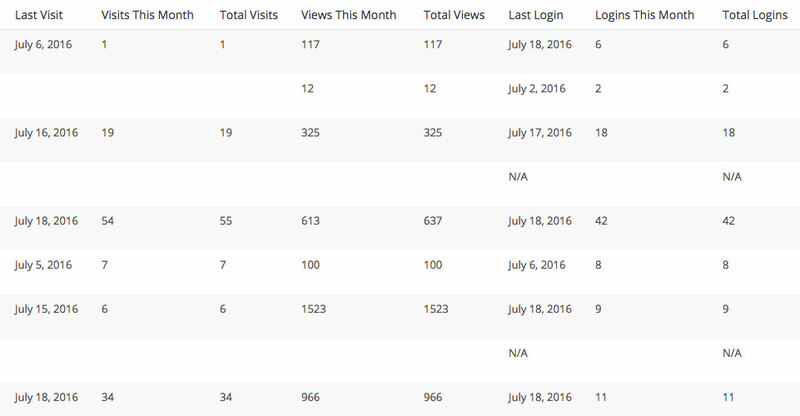 Coupled with a dedicated ‘Members List’ and ‘Orders List’ this gives a lot of control over member accounts as well as quick reference information on how your site is doing. Switching members from one membership level to another is as simple as editing that user exactly as you would to change their email in WordPress; and the added options to email users about the change as well as cancel or update their payment profile within Paypal etc is a useful inclusion. Add-ons such as the ability to create user-specific pages (i.e. where each user has a page containing completely custom information that you’ve entered specifically for them) can definitely add a whole new dimension to your site; yet while the add-on to enable you to manually add new members in the WordPress admin is appreciated it certainly falls into the category of something which you’d expect to be included out of the box. I find myself conflicted when trying to score or even summarise Paid Memberships Pro. In a lot of ways it could be the best WordPress membership plugin ever created, if it weren’t for some potentially show-stopping flaws in core functionality. It can be argued that those flaws are only a problem for people with more advanced needs – but then it’s those very same people who are going to get the most use out of the add-on system. It excels at the “nice to haves” while occasionally falling short in the “essentials” department. One thing is for sure – the innovations coming from the Paid Memberships Pro camp have us very excited about the future of this plugin, and we’re eagerly watching to see what they do next.